Welcome to a brand new blog post! 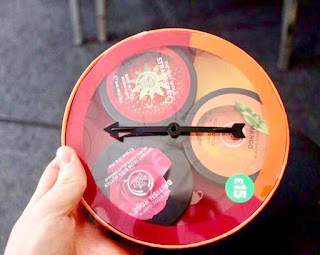 The wonderful guys over at The Body Shop invited me to their Christmas Preview Event at their Briggate Flagship Store and I thought that I would talk to you all about it today. 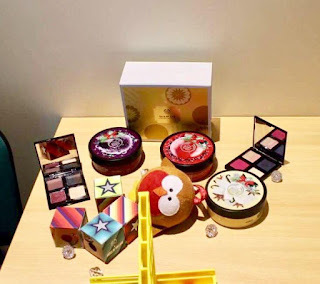 A mixture of red, yellow and purple circular tubs with different shaped gift sets at the side including a golden rectangular one and a green patterned box on a light wooden table on a light background. 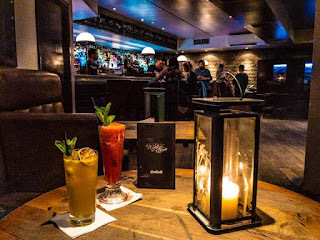 The night began via gathering at the front of the Briggate store and going to the back of the store as the event was held in the meeting rooms that are normally meant for employees and other private things. We started the night off by learning about the concept of the gifts for this years Christmas range. If you buy any of The Body Shops Christmas gifts then you will not only get a great gift set filled with amazing products for the body, but it's also a makeshift game board. Some of the giftsets even come with spinners! We also found out about the amazing Play For Peace. 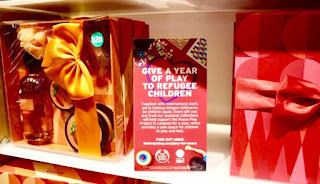 The Gift Sets also help the Play For Peace campaign that The Body Shop are running during the festive holiday period. 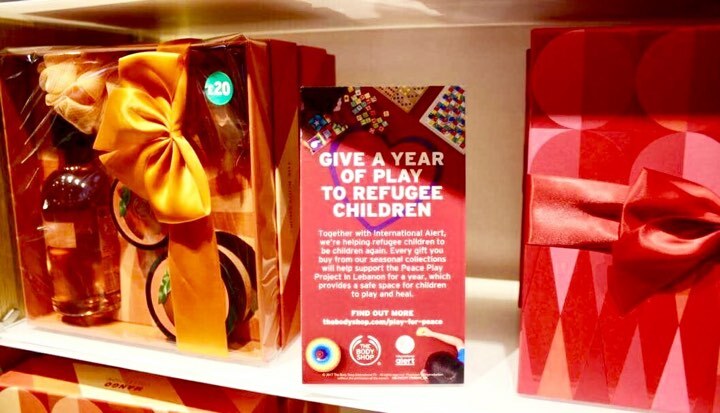 Every gift set that you buy helps children to play in a safe place for a year. After this, myself, Luke and Katie decided to have a play with the ranges that are available in stores for the Christmas period. Frosted Plum, Frosted Berries and Vanilla Chai. Out of all three, I loved Frosted Berries as I am a big fan of anything that is Berry scented or flavoured! If you're more of a floral sort of person then you will love Frosted Plum as I think that Plum has that sort of lightly floral yet still sweet scent to it. If you're more a Vanilla person then I'm sure that you will love Vanilla Chai! Personally, I'm not a big fan of it as I'm very difficult when it comes to Vanilla scented things. We then chatted for a while, then ate some of the wonderful Vegan food that was available at the event including the Sweetcorn based Fritters that were available at the event as I think I ate far too many of them. (All students take advantage of free food though, dont they?!) We then went to go get our pictures taken at the stand which was in a corner of the spacious room. There were props to help the photo. I chose the bunny ears and pretended that I was giving Ariana Grande Dangerous Woman realness... Well, I can pretend that I did, okay?! We then slowly made our way back round to the Briggate store and chatted and wandered around. This what meant for bloggers to get a full play of the new products and to pick up anything that they wanted from The Body Shop. We talked to Katie and Lizi before deciding to go home. We received a wonderful goodie bag which included some of the new products including the Frosted Berries Hand Cream which if you want to know more about then comment down below. Have you checked out any of the Christmas products including the Frosted Plum/Berries/Vanilla Chai products? Let me know down below! Click here if you want to find out more about The Body Shop. Thanks to the wonderful guys over at The Body Shop for inviting me to the Christmas Preview Event and also thanks to the staff at the Briggate store for putting on an amazing event. This blog post was in exchange of an invite to a bloggers preview event and was in exchange of products or services. All opinions and ramblings are my own.